It's time for this week's Cupcake Inspirations Challenge and today we are celebrating with some yummy colors! We are sponsored this week by Meljen's Designs. Wait until you see all the cute stampy goodness she has for you! At first I had a hard time using the colors this week, but eventually it all came together - especially once I pulled out the rhinestones! 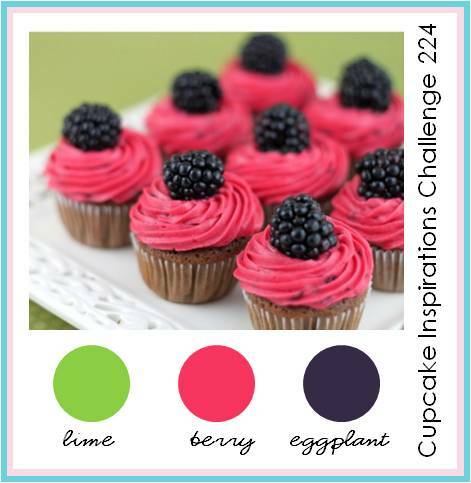 Add your project based on our inspiration photo featuring these sweet and fruity cupcakes. Susie, this card is absolutely fabulous! 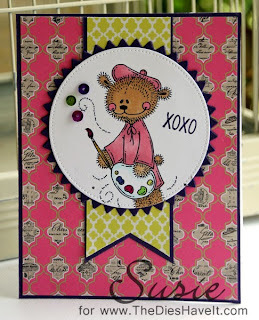 I love the patterned papers you have paired together, and the cute rhinestone accents! It came together fabulously and I wouldn't have guessed that the colors were a challenge for you!